The spirits of Milwaukee’s early pioneers may have said, “You can build your church over my dead body.” And that’s just what the founders of St. James Episcopal Church did. 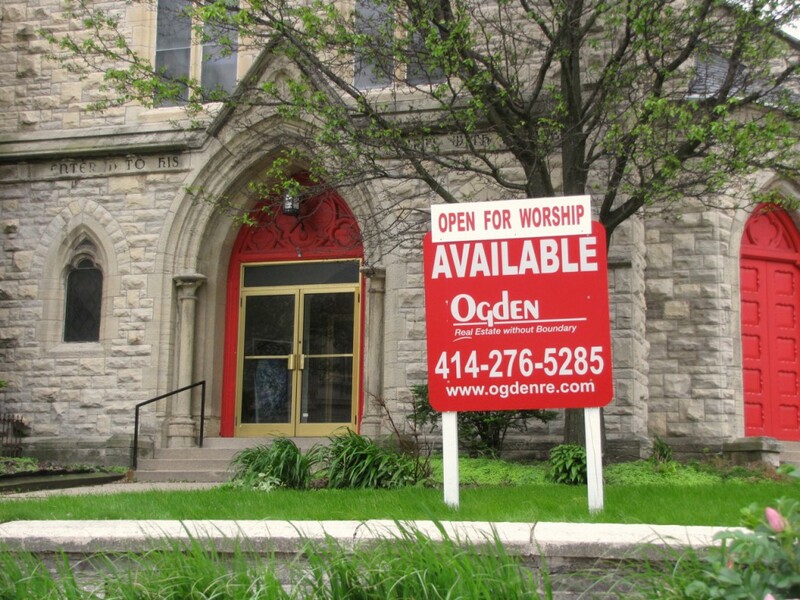 The historic church at 833 W. Wisconsin Ave., is built on the former Spring Street Burial Ground, once the resting place of many of the city’s first European settlers. Early writers left accounts of the beautiful scent of the cemetery’s wild roses. Settler and Milwaukee historian James S. Buck dug many of the graves there. In 1850, St. Paul’s Episcopal Church, 914 E. Knapp St., decided to build a mission church to serve western residents. Although just two miles from St. Paul’s, the disused cemetery selected as the site of the new church was well outside of town. All they needed was a place to stash the bodies. Fortunately, they had just the spot. Five years earlier, in 1845, the church had purchased land southwest of town and established Forest Home Cemetery. So they hired some guys and a wagon or two and started digging. Those guys with the shovels? They sucked at their job. When excavating the foundation for the new church – the same creepily informative Journal article notes – construction workers uncovered an enormous number of bones overlooked when the cemetery was moved. The first St. James was a wood-frame Greek Revival structure originally built for the Unitarian Society and located at Second and Wisconsin. The building was moved to the old burial ground and services commenced in the early 1850s. After a decade of use, that building was replaced by architect Gordon William Lloyd’s magnificent Gothic Revival church, which still stands. The church is built from limestone quarried at Wauwatosa. Robert McKelvey, a stonecutter by trade, served as the construction superintendent. It hosted its first service on July 26th, 1868. 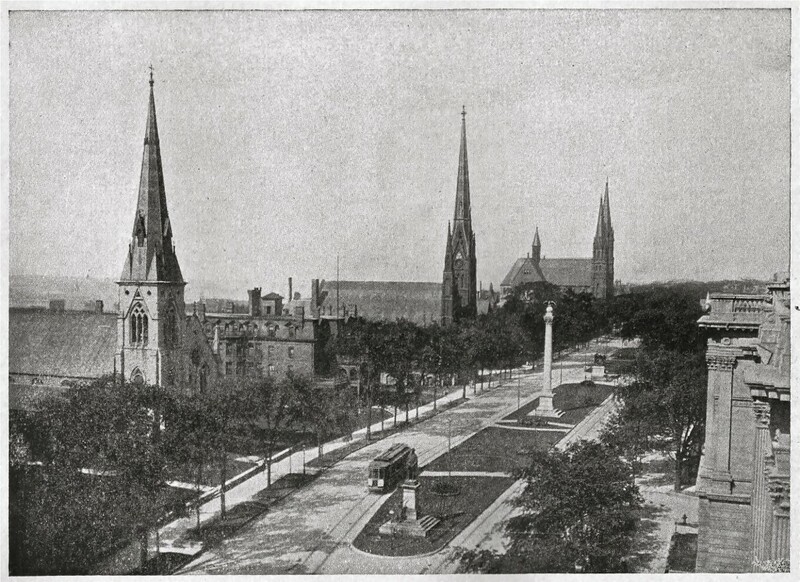 In 1870 the tower and spire were finished, and the next year a carillon of nine bells, manufactured by Jones and Co. of Troy, N.Y., and a new organ, built by Marshall Bros, of Milwaukee, were installed. Alexander Mitchell, a prominent banker and member of the congregation, paid a third of the considerable construction expense out of his own pocket. In an odd coincidence, on July 26th, 1893, 25 years to the day after the first service, Mitchell’s Wisconsin Marine & Fire Insurance Co. bank failed in the midst of a financial crisis. Mitchell didn’t walk far to attend services. His mansion – it now houses the Wisconsin Club – is across the street from St. James. In 1881, when Mitchell’s niece married a local doctor, the banker had a flower-covered bridge erected over Wisconsin Avenue. Wedding guests walked from the mansion to the wedding service at St. James without soiling their fine footwear on the muddy street. 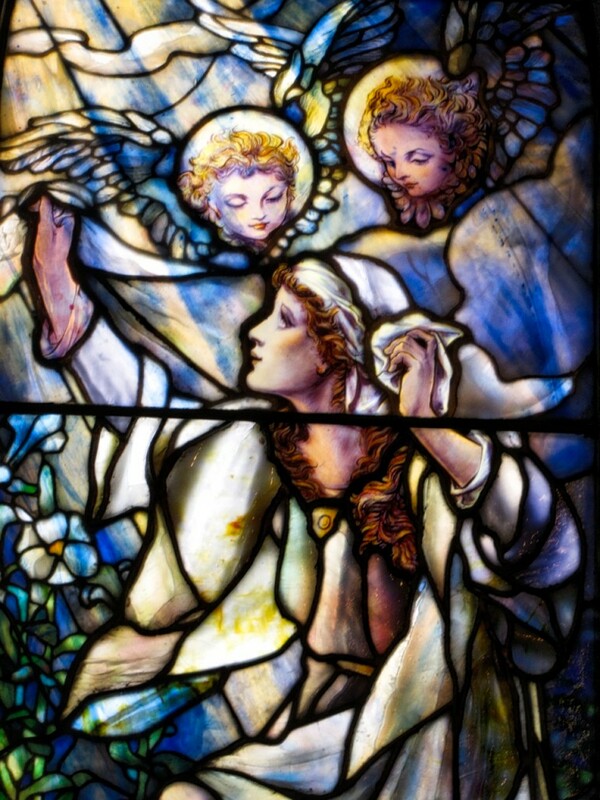 A fire on the evening of Dec. 31st, 1872, gutted the church’s interior. The blaze started in the vicinity of the organ but no exact cause could be determined. At first, it appeared as though the fire would be contained but several errors by the fire department led to the destruction of the building. Only the bell tower and a scorched shell of outer walls survived. Funds were raised and the church rebuilt using architect Gordon Lloyd’s original drawings. 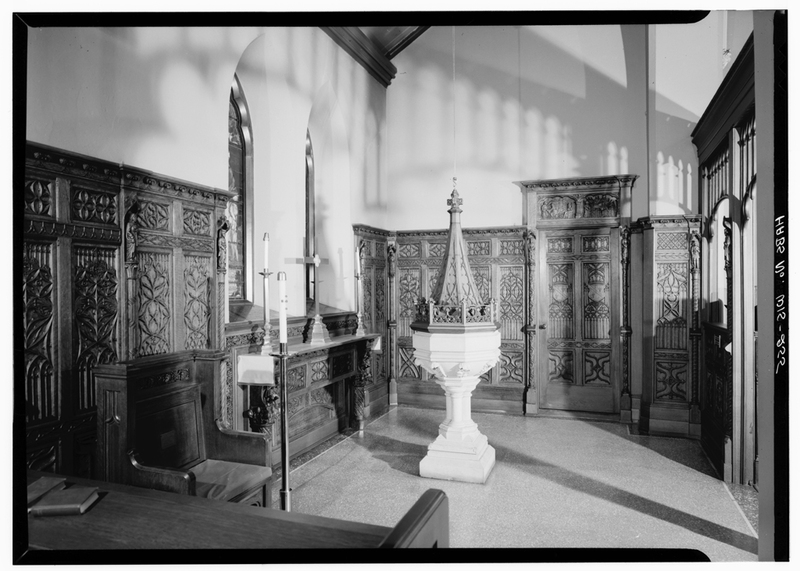 The workmen involved in rebuilding the church donated the stone baptistery font. On April 19th, 1874 the restored church was once again open for services. The church was embarking on its glory years. 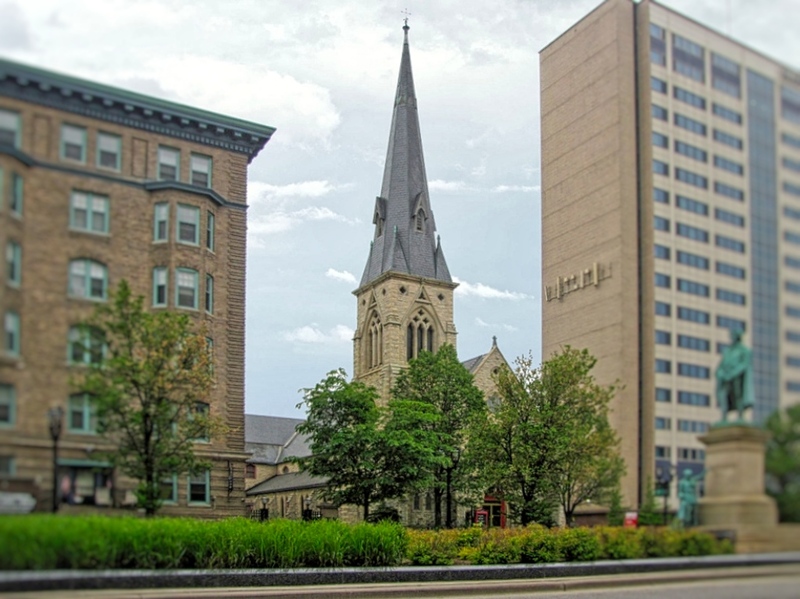 At its peak, St. James was the largest church in the Episcopal Diocese of Milwaukee, a vastly influential congregation in the heart of the city’s thriving downtown. However, it couldn’t quite rid itself of that darn cemetery. 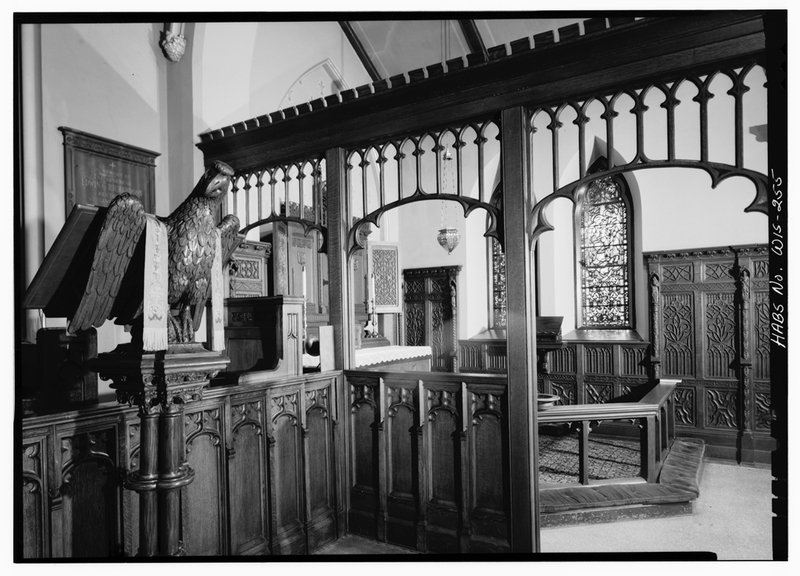 In 1929, the Milwaukee Sentinel reported workmen installing a new organ discovered five headstones in the church, being used as weights for the old instrument’s bellows. Three of the stones carried the date 1839, and all were persons who died before reaching the age of 40. They were Lydia Vinton, age 28, Chester Danforth III, 26, and James Scott, 39. A headstone from 1844 was also found, belonging to Dr. John Parmeli, 43. A fifth stone had only the initials J.A.W. In 1969, when the church was examined as part of the Historic American Buildings Survey, the inspectors found the building in excellent condition, but reported, “The basement of the church has a dirt floor accented by gravestones.” They also noted a few visible burial mounds. In recent years, St. James’ entered a new era, one “more complex in character,” its website says. As the area changed, the church found itself perfectly positioned to provide assistance to the needy at its door – literally sleeping on its doorsteps on occasion. A meal program began and members arranged for donated clothing to be distributed from a space formerly used as a gymnasium. One of the oldest stone buildings in the city, the church is on the National Register of Historic Places and is listed by the City of Milwaukee Historic Preservation Committee. The property includes a parish house, built in 1899, and a 14-space parking lot. The main structure has three levels, seven restrooms, offices, library, chapel, kitchen and hall, and the old gym. It also had bills. 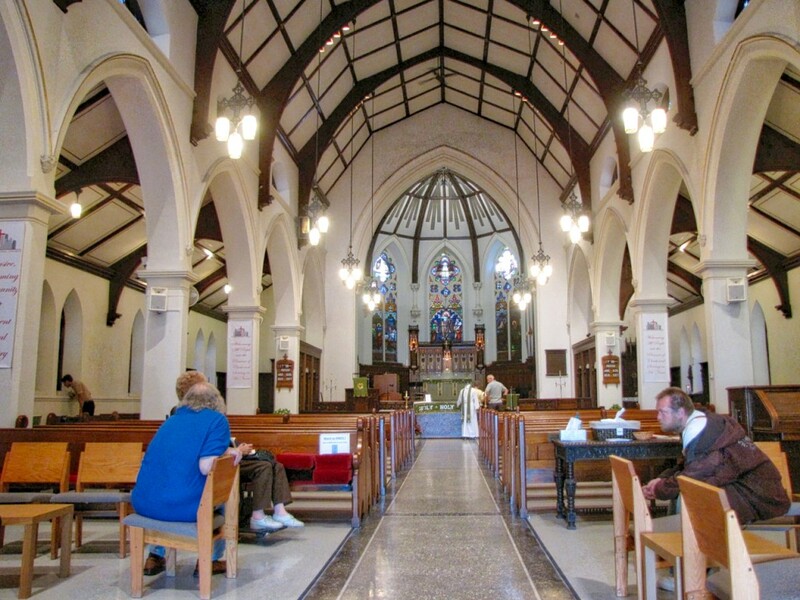 St. James required $5,000 a month just to keep its doors open. That figure included heat, gas, water and sewer, electricity, insurance, basic repairs, and supplies. It did not include staff salaries, program or worship expenses, or significant repairs. Average attendance dwindled to around 30 to 50 people. In 2014, the church vestry put the building on the market. In September 2017 the property sold to a group of investors who plan to convert the building into an event space. It’s a shame that they didn’t give those early pioneers a proper burial . I can see why some people have mentioned getting strange impressions when they are in the basement of the old church. I would wonder if any of the residents in the area of the old Grunenhagen Cemetery have experienced anything over the last century at the 13th./Juneau burial site. I heard stories of builders unearhting wooden caskets while digging the basements of some of the homes in that block. Caskets in the basement are definitely creepy. Thanks for reading!